This Cottage Is unique and comfy with an INCREDIBLE Ocean and Coastline View! We are located on the west side of the Big Island of Hawaii, directly above Kailua-Kona, on the side of Mt Hualalai, in Holualoa, with an awesome ocean and coastline view! Please read our reviews because the view from the cottage lanai is better than we can describe in words! Our new custom built studio cottage is about 500 sq. feet with a roomy wide lanai, and special bistro high seating to enjoy the fabulous ocean view. MUST see to appreciate! The cool elevation of our cottage is 1400 ft. with a beautiful view of the coastline over Honokohau Harbor. The sunsets we get to enjoy are incredible! Holualoa town itself, is a small quaint art village now, and a classic old small Hawaiian town with lots of history. Holualoa area is a very preferred area to stay and live because of the cooler temperatures, Kona coffee country all around, coastline views, and it's close proximity to town. There are several events in our village including "First Fridays" each month when local artists, musicians, food booths and more are all along the streets through Holualoa Town. We love Holualoa and know you will too! Billy and I have lived on the Kona Coast for over 30 years and raised our kids here. Billy is a retired roofing contractor, and I owned retail stores in town for years. We recently built our adorable guest cottage for family and friends, and also to vacation rent for retirement income! It is built with love and creativity! And now we are enjoying meeting travelers and hearing their stories too. We love this side of the island and our awesome cool elevation and total coastline view! We are located up the hill amongst the Kona Coffee farms and yet so close to town. This is why we love living here... it has everything! We are in an ideal elevation and location!!! And trust us on that! You can stay cool, be so close to Kona town, but so private and quiet. This is where Kona Coffee is grown for a reason! Plus you can access the roads to north and south and across the island without going through downtown and traffic. We have lived here for years and this area is our favorite for all reasons. The best of the Big Island! Location!!! View!!! Awesome lanai and barbecue too! Close to town, convenient shopping, but slightly cooler and more peaceful. Very private, and lots lots more. Plus our cottage is decorated with fun eclectic imports and very island style. We supply about everything you will need and will get you anything you want if not already there! Bathroom, with shower, vanity and stacking washer and dryer. We are about 12-15 minutes to the ocean with several places to take a quick dip or enjoy a day on the beach. Historical Holualoa Village is just a couple of miles south, on Mamalahoa Hwy, full of art galleries, a couple of shops and restaurants, and the Holualoa Post Office. Hualalai Mountain is right behind the cottage and on clear days, you can see to the top. From the cottage lanai, there is a fabulous panoramic view of the ocean and coastline overlooking Honokohau Harbor and more. Comfy, cute living area with large TV that swivels to either living area, or to bedroom area. Completely stocked with all you need. Anything else you need....just let us know! Kitchenette includes wide large convection oven/toaster oven, microwave, coffee maker, hot pot kettle, single burner electric hot plate, and more. We welcome our guests with fruit, coffee and half and half. We also leave a goodie or two for your first morning. 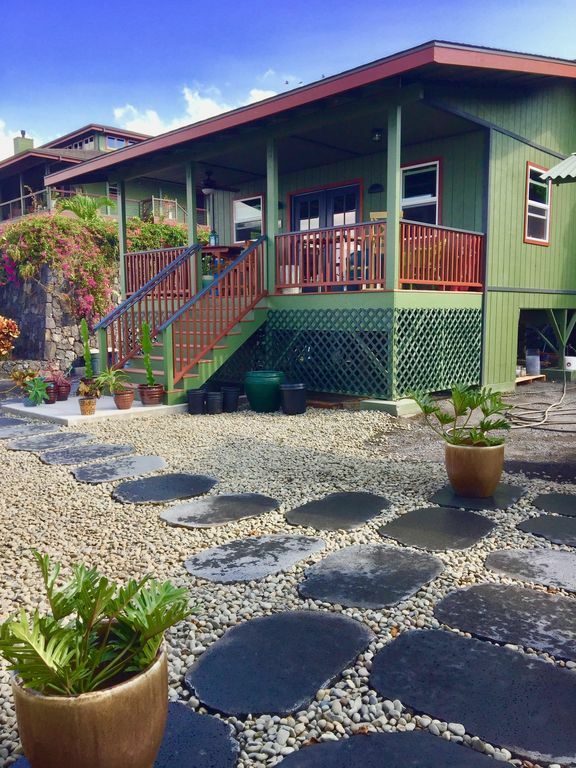 Our cottage location is super convenient to access downtown, or travel along the upper mountain highway, or to head north to Waimea, or the saddle road to Hilo. We are minutes away from shopping, beaches, walking thru town, or along the coast at a couple of our parks.